I've never actually done an elephant ride. It's never been a thing I really fancied doing though I am sure it would be a fun thing to do and a lot of visitors to Thailand want to do it. 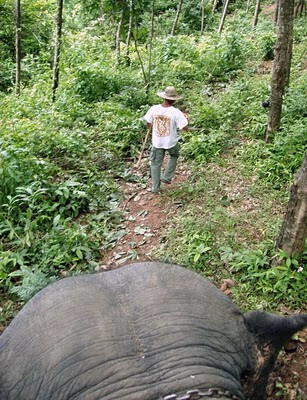 There are elephant trekking places all over Phuket. Some are close to the main beaches, others get a bit more off the beaten track (better in my opinion, I don't want to be trekking with a view of Patong or within earshot of a busy road!). And it's good business for sure, riding an elephant is on many tourists "must do" list. My parents have been over here visiting a number of times, and it was on their 2nd visit in 2004 that they went off for an elephant ride. I asked mum to write about the experience.. although it was over 5 years before she wrote this in 2010 and she forgot a couple of things - can't remember exactly where the place was, but it was between Kata and Naiharn... and she's not sure of the price they paid, but said she did bargain a bit and the price seemed quite reasonable for a new and unique experience. Some people are against using elephants in this way and say the animals are not treated well. My parents experience was only positive, but just last week there was an incident in Phuket where an elephant went wild, a couple of tourists were injured and the elephant threw a car down a hill. That is of course a very rare occurrence - I've never heard of such a problem before in Phuket, but remember that elephants are wild animals no matter how many years they have been working with people. 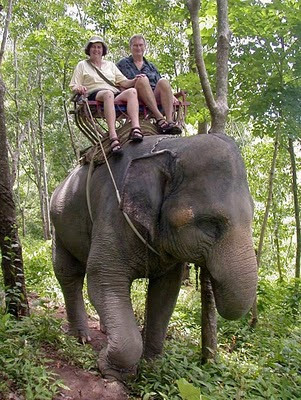 If you want to book an elephant experience or any other Phuket tour, contact my friends at Easy Day Thailand. Update - I asked about elephant rides on my Jamie's Phuket Facebook Page and got plenty of answers from tourists and animal lovers alike - see Have you done an elephant ride in Phuket? Update 2017 - The Phuket Elephant Sanctuary is open and hopefully they might invite me to have a look! Hello! 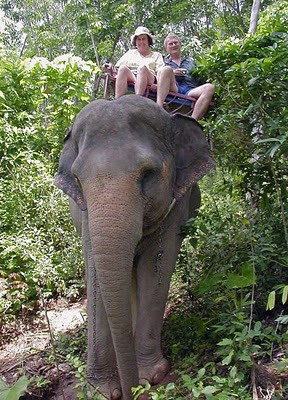 OK, here are my Mum's words ... Our Elephant Experience in Phuket in 2004 by Paula Monk. When I was a child I would look through my books and see pictures of far away, wonderful lands. I was fascinated, but in the 1950s, growing up in post war Britain, it didn't seem possible that I would ever see any of those places for myself. I was filled with wonder at the sights of children riding on elephants and imagined how it would feel. That little dream lay dormant for almost a lifetime. The world has moved on during that life time and people travel far and wide – ordinary people like me. Now we have family in Thailand (it was called Siam in my childhood) and on one of our visits I was determined to fulfill my childhood dream. I can't now tell you the name of the place where we went for our elephant ride. It was in the rural south of the island, in hilly terrain. I feel there couldn't have been a better place – the elephants were well looked after and so were we – my husband and I. The jungle was thick and lush and the views from the hill tops were superb. We climbed up onto a platform of wood and bamboo to wait for our elephant and the young man who would guide us through our adventure. The back of the elephant was level with the platform and we climbed onto her back – I wish I could remember her name – and tried to get comfortable in the hard metal howdah. Even before we started to move we felt rather insecure, perched up there. It is high up and the seat is not strapped too tightly to the elephant. Slowly we moved off. I was all grins and happiness! 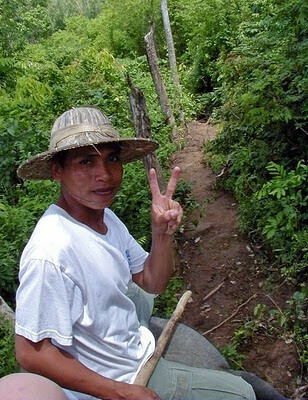 At first the ride seemed fairly smooth, but soon we were traversing the slopes of the jungle through narrow pathways. It was like a fair ground ride – I was thrilled and exited and scared stiff at the same time! Going down hill it almost felt like we would be lurched forward and roll over the beautiful elephants head! We hung on tight and enjoyed the thrill. Mostly our elephant strolled slowly along the familiar paths – sometimes she broke into almost a trot, accompanied by gasps and squeals from us. Our elephant man started the ride sitting on the elephants head, between his ears. Often we would stop completely when the elephant felt like a nibble at the trees – her trunk swinging to reach the tastiest bits. After a while our elephant man slipped down from the elephant and walked ahead. Oh my! 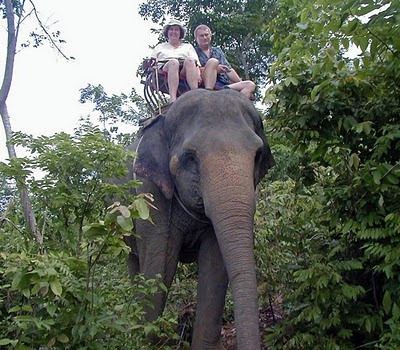 Here we were, my beloved and I riding alone on an elephant though the jungle! Did I ever dream that I would be doing this? Soon our young guide came back and asked for my camera – a moderately simple digital camera. I wondered if he would know how to use it. But he was a superb photographer and we have a collection of fantastic photos of the pair of us on our elephant. The pictures definitely capture the excitement we were experiencing, far more than the fear. Our ride lasted for a long time – about an hour we recall. As we realised we were coming to the end of the ride we became aware that we felt physically tired. It is hard work to keep the body stiff and alert and to be holding on tight. But above all, we felt exhilaration that in our 60s we had taken the chance to fulfill a dream. We climbed from the back of our beautiful elephant onto the platform. The world seemed so still and at peace. We climbed down and gave her some bananas. Wow, she looked so big from ground level! Then she was led away for a rest and to wait for the next people to delight in the experience. We fed young elephants before we left and stroked their heads. It was a lovely place to be and has provided us with a treasured memory.